As Vision Advertising’s Inbound Marketing Specialist, Catherine’s work touches all corners of digital marketing, with an emphasis on marketing practices such as content creation, social media marketing, blog writing, and more. Catherine manages our internship program, assuring our interns are getting the most out of their experience. She supports them as well as the rest of the Vision Advertising team with project management, content editing, and her positive attitude. With all of that, she has a huge passion for creativity, being a team player, and loves to learn new things. Catherine has spent the last four years mastering the art of marketing. She has taken her fun personality and channeled it into making effective and entertaining content for her client’s audiences. Not only is she a creator but she also has a passion for helping her clients and team members succeed. She is always reaching out to see where she can help edit, plan, or lend a helping hand. Catherine attended Nichols College and graduated with a Bachelor of Science and Business Administration degree. Catherine worked in the Nichols Marketing Department as the Student Assistant Coordinator. 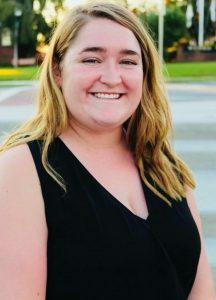 She compiled stories to share with the followers of the Nichols blog page, Bison Chronicles, coordinated marketing student employee schedules, and was leader of all marketing tasks including video and virtual tours. Prior to joining our team, Catherine worked for a job board website in the eCommerce online research department. She supported the sales team and worked as a lead generator by researching Twitter for potential site candidates. Catherine also created videos and worked on email campaigns to communicate with other regions within the company. Catherine was introduced to Vision Advertising at the Nichols College Career and Internship fair where she met with Julia Becker Collins, our Vice President of Marketing & Operations. Immediately Catherine knew that she wanted to work in a small marketing agency where she can gain all the best knowledge. When she heard there was an opening, she went for it and secured the position. Catherine knew Vision Advertising was the perfect match and we are so glad to have her. When Catherine is not at work, she is at home spending time with her huge Irish family, she is one of 16 grandchildren. If she’s not at home, she is hitting golf balls with her dad or visiting her family’s house in York, Maine. She enjoys a lazy day where she can drink a delicious cup of coffee, indulge in all that Netflix has to offer and watch her favorite movie Bridesmaids. Catherine is super friendly so whenever you see her be sure to say hi.